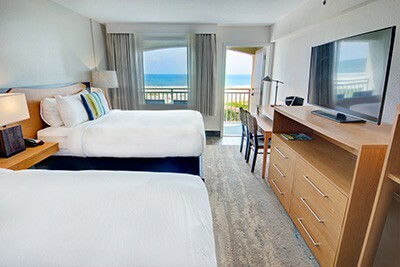 Wake up each morning to dazzling views of the beach and our sparkling outdoor pool when you stay in one on of our fully renovated Oceanfront Rooms at Guy Harvey Resort St. Augustine Beach. Our Oceanfront Rooms are located on the 3rd, 4th and 5th floors and look directly out over the Atlantic Ocean and our outdoor swimming pool. Each guest room has a private balcony, perfect for lounging over coffee and a sunrise. 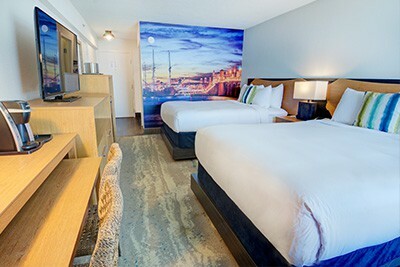 These rooms are designed with wall murals that showcase the beauty of St. Augustine, from the historic lighthouse to the rolling waves. 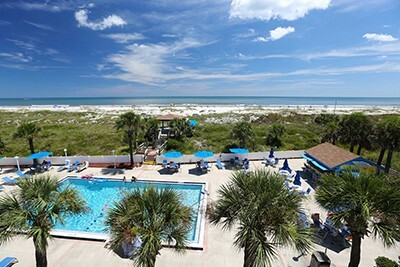 When you are not taking the oceanfront view from you room, stroll down to the beach via direct access from the outdoor pool deck. Available with one King Bed or two Queen Beds. Please note that our pool will be closed for needed repairs starting February 24th for one week. We apologize for any inconvenience caused. Thank you in advance, and please do enjoy our beautiful beach during your stay. If you are using a screen reader and are having problems using this website, please call (904) 471-2555. Information and assistance available 24 hours a day.